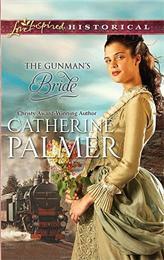 And yes, I freely admit, what drew me to this novel was primarily a) the word "gunman" and b) the train on the cover, with a dash of c) pretty dress (I'm no expert on Victorian fashion so I'm hard-pressed to discern the accuracy). Bart Kingsley had followed her to New Mexico, ready to lay his love--and his life--on the line. But spirited Laura Rose had made a fresh start for herself. She hadn't left her controlling father in Kansas to let some gun-slinging outlaw ruin her hopes--no matter what scandalous past they shared six years ago. Or how his green eyes beckoned! Rosie was his light in the darkness--Bart would do anything to win back her trust. But he was a wanted man. Would the past, with its dangerous demands and debts, conspire to destroy their new beginning? Or would his faith in God--and in Rosie--be rewarded? The majority of the conflicts can be summed up by Bart's line: "It's not other people who come between us, Rosie. It's us. We keep tearing this thing apart. Why? Why do we do that?" So if you love romances based around misunderstandings and distrust, this is your kind of book. *I was surprised to find that quite a few minor characters were based on or inspired by historical figures--there was more research here than I'd expected. *At one point in the book there are numerous wanted posters for our green-eyed, half-blooded Native American hero Bart. I would have thought the townspeople would instantly recognize Bart from the description, but they didn't seem to. So I would've liked to see that issue more clearly addressed. Were men with those features actually fairly common in 1880s New Mexico? Or were the townspeople going easy on Bart and I missed it? *Bart's obsession with Rosie's feet made me squirm (mercifully, that obsession seems to wane). Now, in fairness, I do believe the legs were considered indecent in Victorian times (I've even heard that instead of saying "leg" they would have to say "limb" or "extremity" to be proper!). But that doesn't mean I didn't find it uncomfortable. *Bart's literal answer to Rosie's prayer near the end, which hearkened back to the very beginning of the book with the near-climax, made me laugh out loud in delight. Given that I'm not huge on romances, that was pretty good. I'm reading this book now. 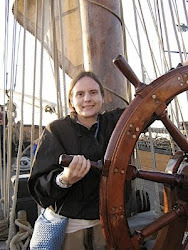 Catherine Palmer is a veteran author and I've been reading her books for over 15 years. I love the way she writes and she always picks up on interesting historical facts. I agree about the green eyed thing. But what I've learned about this particular genre is that they seldom depict the heroes on the cover due to marketing. I guess since it is the "Bride", she is featured. Beautiful cover, but I sure would have like to "see" that Bart, he's making me swoon! I actually agree with you, that just having the woman on the front is probably better marketing. I didn't care at all for the visualization of Edmund Merrick on the cover of Marylu Tyndall's "The Redemption." It only struck me as odd that three other covers that released in the same line, in the same month, had the hero on the cover with their heroine. But that said, this one was the book I was drawn to in the pile, so again, it actually may have been better marketing. Bart's IS a character, all right, isn't he? I agree; it would've been really interesting to see a depiction!